A surprise November takeover by British Speedway Promoters’ Association (BSPA) chief Buster Chapman was accompanied by an equally as unexpected return to the top flight for 2019 following five seasons in the second tier. Ged Rathbone and Carl Johnson. Chapman’s purchase of the city club was greeted by a mixture of admiration and acrimony given he bought another promoted side, Ipswich, at the same time and was already the long-standing owner of King’s Lynn. And then came more controversy in mid-January when former Grand Prix star Chris Harris was suddenly axed from the line-up for financial reasons - only to join Ipswich a few days later. At least the arrival of Australian star Rohan Tungate as a just-as-capable but probably-much-cheaper replacement ensured the Panthers septet still looks to be one capable of challenging for honours. Then there is the worst kept secret in the sport surrounding the resignations of Ged Rathbone and Neil Watson as promoters - something finally confirmed by the club today. All of the above meant there was plenty to talk about when sitting down with Chapman a few days ago. “I always felt Peterborough was a club that should be in the top league and the same thing applies to Ipswich too,” said Chapman. “Bringing both clubs up to the Premiership to take the number of clubs up to seven ensured the sport didn’t go into oblivion in my opinion. “If I’d asked my wife first, I doubt I would have bought either club, but I just went ahead and did it! “I certainly haven’t done it for financial gain, but I have a huge love for speedway and believe it can become a big sport again in the future. “All I’ve done is tried to protect the league by making these purchases, but I have nothing to do with the day-to-day running of the clubs. “I did the same with Leicester a few years ago when it was in trouble and I had no hesitation in selling when the right person came along. “And I would happily do the same thing with both Peterborough and Ipswich if people were to come forward and prove they have the means to be in the sport for the long haul. “The agreement is for Peterborough to be in the top league for the next three seasons as long as it is financially viable, but I hope that is the case for much longer than that. “We obviously can’t do it without the fans turning up in force and without bringing in plenty of revenue through sponsorship. 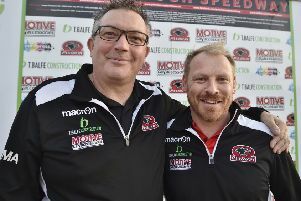 Chapman insists he had no option but to remove Harris from a budget-breaking Panthers team, but is confident the club’s chosen septet can flourish this season on an improved East of England Arena surface. “The Harris situation should never have happened,” added Chapman. “Ged was given a budget to work with when building the team, but that budget was broken by a long way which could have led to the club losing a lot of money. “We had to cut our cloth and that’s why we took the course of action we did in letting Chris go, but we’ve managed to bring in a very capable rider in Rohan as a replacement on a lot less money. “We knew we had to really let one of the top three riders go and ‘Bomber’ was the one we felt had to move on. “I have to say that Ged did put together a very good team but it was too expensive. “I think there will be a lot of entertainment from this team and I look forward to watching them whenever I can. “I know how good Peterborough can be as both a speedway club and race-track. “I prepared it for the World Cup meeting back in 2009 and received a lot of praise for it. “I feel sure it can be turned into one of the best tracks in the country when working with the right machinery and material. I’ve already bought a brand new grader, a new set of harrows and 90 tonnes of shale. That’s an outlay of well into five figures on top of purchasing the club. “I’ve been putting the hours in on it during the last few days as well, but it is always a case of having to invest time as well as money in speedway. Chapman stresses he has parted on good terms with Rathbone and Watson following their resignations as promoters. He is also confident the appointment of veteran promoter Colin Pratt will be a smart move while team boss Carl Johnson is set to have more of an input behind the scenes. Chapman continued: “I’ve have no fall-out with Ged, but we feel it is right to move on and start with a clean sheet. “Sometimes it’s easier to work with people you know and who are more local to the club. That was the thinking behind bringing Colin in and also in giving Carl much more influence in the running of the club. “I’m sure every Peterborough supporter would like to thank Ged and Neil for their hard work and service to the club. 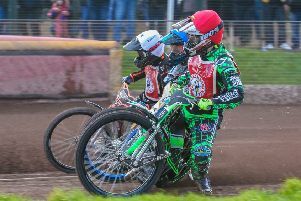 Chapman, Pratt and Johnson will all face the fans tomorrow night (Friday) at a pre-season forum organised by the Peterborough Panthers Speedway Supporters’ Club (PPSSC). Doors open at the Post Office Club, on Bourges Boulevard at 7.15pm. Admission is £2 for PPSSC members and £3 for non-members.